As a senior, making the transition to a nursing home or assisted living facility can be difficult. You are not only making a change in your location, but your lifestyle. One of the most important things to think about when you are moving to a nursing home is how you are going to get all of your items from your old home to your new one. Having friends and family assist you with the move is an option, but a less stressful choice is choosing a professional moving company. Here are some reasons you should consider using the services of a moving company. 1) Reduce Stress-The idea of moving all of your possessions yourself can be an extremely overwhelming thought! When you hire professional movers, especially ones that specialize in senior moves like Garrett’s Moving and Storage, you can count on your entire moving experience being taken care of. A moving company will pack, load, unload, and rearrange all of your items. You won’t have to move a finger! Using a moving company is often less of a hassle than relying on family or friends because a moving company will give you peace of mind that your move with be coordinated with your schedule and needs. 2) Assistance with Downsizing/Storage-Your nursing home or assisted living facility will usually be smaller than your current home. This means not everything will fit in your new location. Fortunately, moving companies, especially those with storage facilities, can help you store all of those things that won’t quite fit into your new home. 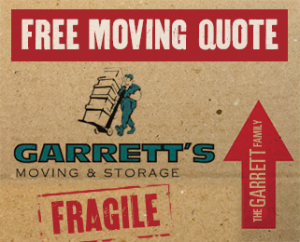 Knowing that seniors often need the use of storage facilities, Garrett’s Moving and Storage is offering free storage for its senior moving customers. Contact us for details. Garrett’s Moving and Storage is a Dallas moving company that specializes in helping seniors move to nursing homes or assisted living facilities. We’ve been in business for over 20 years and have an A+ BBB rating. We also have a best-in-the-industry extended coverage policy. Contact us today at 972-487-5843 for a free estimate or click here to request a quote online. This entry was posted in Stress Free Moving Tips and tagged Dallas Moving Companies, Movers in Dallas, Moving Tips, senior moves. Bookmark the permalink.